A trailer has debuted for 2036 Origin Unknown starring BSG's Katee Sackhoff. The interstellar sci-fi mystery is directed by Hasraf Dulull with a screenplay by Gary Hall. Gravitas ventures will be released the flick in select theaters and on VOD, June 8th. After the first manned mission to Mars ends in a deadly crash, mission controller Mackenzie 'Mack' Wilson (Sackhoff) assists an artificial intelligence system, A.R.T.I. Their investigation uncovers a mysterious object under the surface of Mars, that could change the future of our planet as we know it. 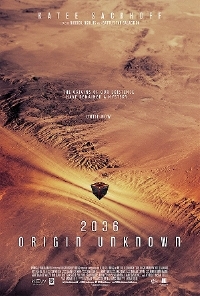 Check out the trailer for 2036 Origin Unknown below! AI with British accents. Because you'll feel smarter while you're dying. From the rogue computer to the buried sentinel artifact, this looks entirely derivative of 2001 with a dash of Forbin Project.